2K has this week released a big update for their iOS and Android game, WWE SuperCard. 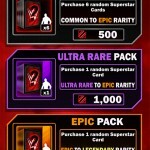 The collectible card game app has been regarded as very successful for 2K and WWE, reaching over 3 million downloads since its release last month and gaining average ratings of 4.5/5 and 4/5 on the App Store and Play Store respectively. By popular demand, the new Ultra Rare Card Pack enables players to acquire cards of Ultra Rare or higher value, and will now be available for purchase alongside the existing card packs on sale. WWE SuperCard will take real life WWE matchups and let you pick a side. Earn wins for your side to increase your rank, win the matchup, and acquire exclusive cards based on your performance! This challenge is a week-long event where players will receive victory points by playing matches – play against higher ranked players and win to receive more points. Victory points you receive will also add to the total point count of every player who is using that WWE Superstar. The higher rank you have at the end of the week, the better your reward will be. This is a great new way to win higher level cards. 1) Pick the SuperStar you want to play for. 2) Play the People’s Champion Challenge to earn wins for your SuperStar, and points for you. 3) Each time you win, the SuperStar you are playing for gets one win. 4) When you win you also gain 1, 3 or 5 personal points based on your opponent’s deck level. 5) The points you earn move you up in rank. Check the leaderboard to see how you’re doing. 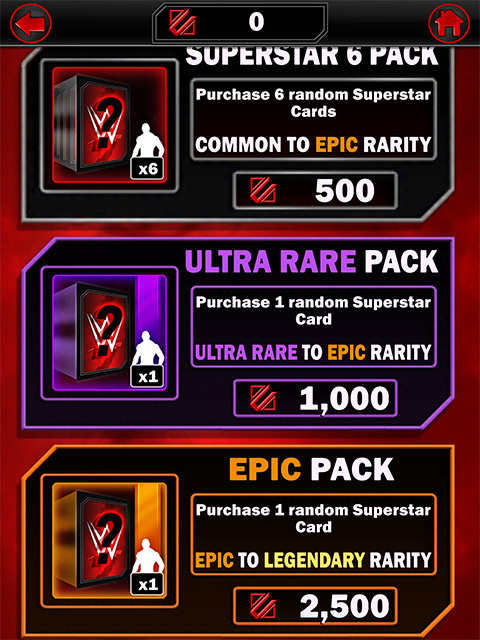 7) The SuperStar with the most wins at the end will determine what card prizes will be used as the rewards for all players. 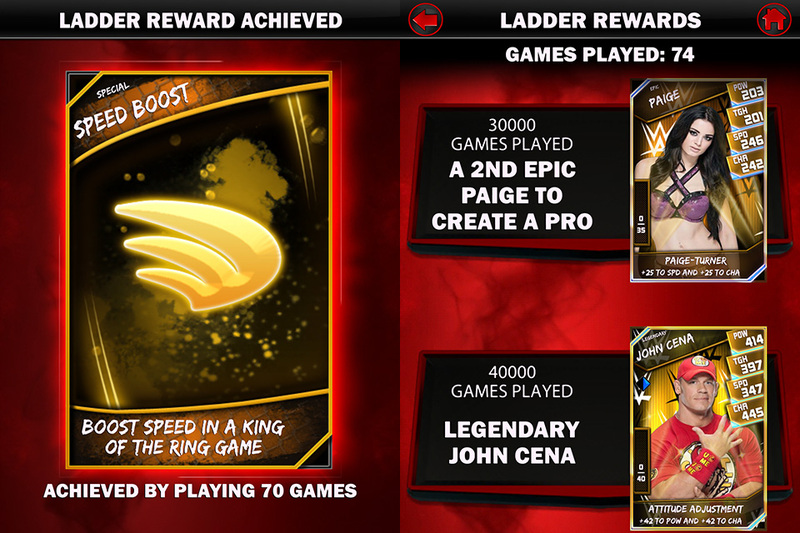 These exclusive new cards are only available a prizes via the new “The Ladder” mode. This addition to the game provides more re-playability with a new incentive, because every exhibition game counts towards gaining ground in your climb to get to the top of “The Ladder”. The higher you climb, the more reward tiers you will unlock. Progress indicators will track your victories and tell you how many games left until your next big prize! Possible prizes include various rarities of John Cena and Paige cards exclusive to this mode, as well as credits and stamina cards.